Lakeside Beach is a private resort located near the center of town on the south shore of Lake Tahoe. A section of the beach is reserved specifically for your special day. 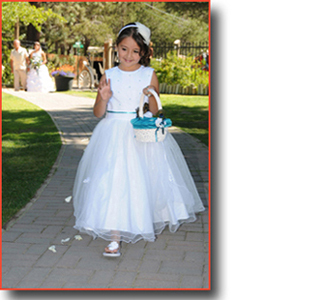 The spacious area where your wedding is held is at the waterfront that poses a fantastic panoramic view of the surrounding Sierra Nevada Mountain Range along with the striking blue, pristine water of Lake Tahoe, which lies in the foreground of the mountainous peaks. The amazing landscape is cause for immense photographic opportunities during your ceremony and formal photography afterwards. 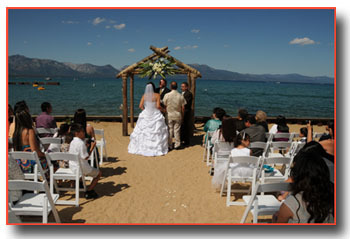 Lakeside Beach is an exceptional waterfront location and a perfect place for a Tahoe wedding. This private venue provides seating for up to 150 guests, an arch, traditional wedding music, and an attendant who will greet and direct your guests as they arrive. Your guests can relax to the pleasant music provided by the resort and enjoy the pleasing view as they anticipate your walk down the aisle. Another benefit of the resort is that their staff attendant will assist with the organization of your wedding party prior to commencement of the ceremony. The extra attention you’ll receive at Lakeside Beach will ensure that all goes as planned, providing you with a stress-free day for a very special occasion.